8" Christmas With Annalee� has blue eyes, freckles and short brown furry hair. She wears a red and green pinafore style dress that has green sleeves and a red pinafore. The pinafore hem is trimmed with red and white striped cording. In addition, there is green ric-rac around the waist. The hem of the red and white striped attached underskirt is trimmed with green ric-rac. Red and white striped tights, a red felt 'elf' hat with a spiral of green leaf trim that leads to a red poinsettia at the tip, and green felt, pointy 'elf' shoes accented with red pom poms are the finishing details. 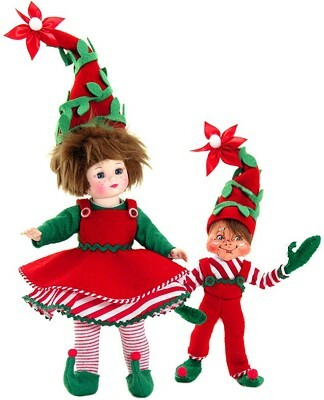 Her Annalee felt elf, with a painted face, is dressed in a coordinating outfit. Retired item - available for limited time.